Phase 1: Anatomy of in-depth listening. Students write about four of their own experiences with in-depth listening: two that they had as speakers (one when they felt listened to and one when they did not) and two as listeners (one when they recall listening closely to a speaker and one when they did not). They describe behaviors, observations, and feelings they remember associated with each memory, concluding with a reflection on what “good” and “bad” listening look and feel like, as well as what effects they can have on one’s capacity to express oneself or relate to others. Responses are compiled for everyone’s review. They provide extensive insight into the power that listening and non-listening can have to enhance or undermine respectively a speaker’s comfort, focus, clarity of thought, ability to communicate effectively, capacity to stay in the conversation, and self-esteem. Phase 2: Practice of in-depth listening. Students conduct one face-to-face interview with someone they know well. They focus on understanding views that their interviewee holds but that they, themselves, find objectionable. The goal is to gain clarity on those views and the reasons behind them, while refraining from interpretation and judgment. Students are advised to ask all questions necessary to see the subject in question from their interviewee’s perspective. They are reminded that their task is understanding, not necessarily agreeing. Written reports provide reflection on what students learned and how they performed as interviewers. The latter assessment includes interviewee feedback as well. Phase 3: In-depth listening in engineering and science. Students conduct a sustained investigation into an unfolding engineering controversy, which culminates in one in-depth ethnographic interview of an affected stakeholder whose voice is underrepresented or misrepresented in official depictions of the case (e.g., parent, grassroots community organization representative, whistleblower, scientist advocate). Final reports consist of a detailed description of the case; a discussion of key moral transgressions as identified by interviewees; interviewee values, goals, and visions of a just resolution; “lessons learned” that may have changed students’ original understanding of the case; reflections on the conduct of engineers/scientists in the case; and thoughts on actions students, themselves, would want to have taken if they were themselves involved. Although usually each student selects a topic of his/her choice, in 2012 all students interviewed stakeholders in a case we preselected: the Clean Air Coalition of Western New York’s (CACWNY) fight against Tonawanda Coke Corporation’s benzene air emissions. The aim of this final phase is to enable students to see a case from the perspective of a marginalized stakeholder and to appreciate that diverse knowledges, values, and goals can add crucially important and technically relevant complexities to official depictions of engineering/science controversies. This exercise is an adaptation of the work on public narrative and the Story of Self of Harvard University sociologist and senior lecturer in public policy Marshall Ganz, PhD. The version of the “Story of Self” we developed for “Engineering Ethics and the Public” is based on the premise that best practices in engineering and science require practitioners to remain deserving of the public’s trust by staying attuned to their primary and most fundamental obligation: the protection of the health, safety, and welfare of the public. As an increasing number of real-world controversies has shown, upholding high ethical standards for a client that is too often “unseen” and “unheard” can become a challenge even for the most well-meaning engineers and scientists when they lose touch with the ideals that brought them to their fields in the first place. Additionally, a majority of engineers and scientists go through years of educational training without ever articulating these ideals (let alone reflecting on them or refining them). Stories are how we learn to make choices. Stories are how we learn to access the moral and intellectual resources we need to engage with the uncertain, the unknown, and the unpredicted. Because stories speak the language of emotion, the language of the heart, they teach us not only how we “ought to” act, but can in fact inspire us with the “courage to” act. And because the sources of emotion on which they draw are in our values, our stories can help us translate our values into action. Our students are asked to write their “Story of Self” at the beginning and end of the course. The purpose of the two iterations is twofold: they allow for personal reflection on changes one may have undergone during the course of a semester, as well as for appreciation of the value of revisiting and revising one’s narrative, as one’s personal and professional circumstances evolve. affirmation of one’s commitment to one’s field and articulation of aspects of one’s field that make one’s aspirations realizable. The course’s weekly blogging assignment is based on the work of Gardner Campbell, PhD, Vice Provost for Learning Innovation and Student Success, Dean of University College, and Associate Professor of English at Virginia Commonwealth University. Inspired by Dr. Campbell’s ‘Narrate, Curate, Share’: How Blogging Can Catalyze Learning, this assignment requires students to develop a personal class blog on which they post weekly reflections in relation to their journey through the course. Students are also expected to read and post comments on each others’ posts. Blogging offers students a unique opportunity to deepen their thinking about and make personal and innovative connections to readings, class lectures, class discussions, guest appearances, and assigned projects. Apart from expanding the conversation outside the walls of the classroom, the process encourages self-exploration of personal and professional values, assumptions, biases, insights, and aspirations as well as self-expression of cognitive and emotional reactions in ways that render students more “visible” to themselves, their classmates, and to us, their instructors. A notable benefit to the exercise is that it allows students to notice their evolving moral selves and the impact that “who” they are at any given time can have on their perception and response to any given situation. We have found this to be a critically important lesson because it challenges a common assumption: that if one is a “moral” individual, one will also be a “moral” professional. that can create circumstances conducive to both morally sound and morally deficient professional conduct. In light of neuroscience and social science research highlighting that a) moral decision-making in everyday life is not reducible to abstract moral calculations, and b) emotion plays a far greater and necessary role in robust moral decision-making than previously thought, we view student awareness of their own role and agency in moral decision-making essential to ethics education and future moral action. Highlight prevalent phenomena that are morally relevant to the work-world of engineers/scientists (e.g., the power of institutional culture over individual behavior; engineers’/scientists’ vulnerability to self-deception during times of conflict, stress, or great ambition; and the potential technical and moral value of non-engineer/non-scientist perspectives). An Air That Kills: How the Asbestos Poisoning of Libby, Montana, Uncovered a National Scandal by Andrew Schneider and David McCumber. Students are encouraged to engage with the book both intellectually and emotionally by analyzing a moral issue they find compelling using moral theory, drawing on their artistic imagination, and taking a stance that they defend in class. We use this exercise to support students to think and express themselves in ways not normally encouraged in the classroom, push them outside their personal and professional comfort zones, and enable them to begin to see commonalities between their own sensibilities and those of the publics that they might one day affect. Book description: Told from the perspective of affected residents, this is a history of corporate mining in Libby, Montana that released toxic waves of asbestos dust into the air for several decades and sickened or killed hundreds of unsuspecting miners and their families. The book chronicles a community’s fight for justice and the formidable obstacles it encountered along the way. The protagonist is environmental public health, as it was assaulted, defended, undermined, and negotiated by a corporation, the government, the legal system, and the public. 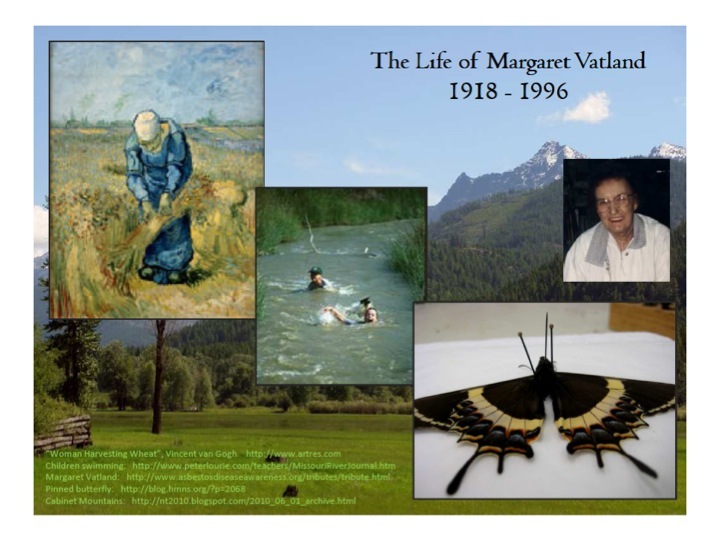 Among the many lives impacted by, and lost to, asbestos, I chose to focus on the life of Margaret Vatland. This choice was motivated by one very poetic sentence in “An Air That Kills.” To describe how Margaret was now struggling to get out of bed due to her asbestosis, the authors wrote, and I paraphrase, “this woman who had harvested wheat and taught her kids to swim in the creek, was now stuck in her bed like a butterfly pinned to a board.” I found that description to be very powerful, so in my image I wanted to depict the contrast between the vibrant, hard-working life Margaret had lived, and the manner in which she was dying. Book description: This book details the historic events of August 28-September 8, 1854 when the Soho district of London was struck by an acute cholera outbreak that killed hundreds of residents in a matter of days. The identification of the outbreak’s cause was as urgent as it was daunting. 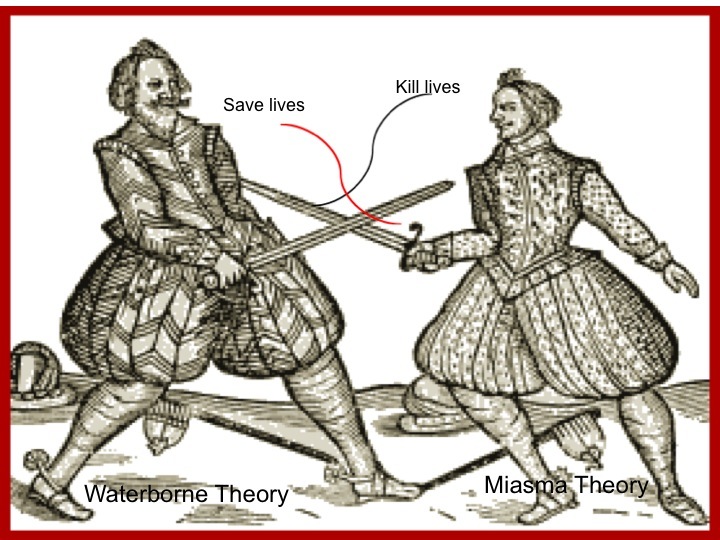 The germ theory of disease was still in its infancy and the miasma theory – which claimed that diseases are caused by toxic air – dominated medical thinking. The puzzle was eventually solved and the medical community’s thinking, changed, by the unlikely partnership between John Snow, a local doctor in his 40s, and Henry Whitehead, a local clergyman in his 20s, who worked painstakingly to amass crucial evidence and did not shy away from transgressing the intellectual bounds of their time. This book demonstrates the power of intellectual paradigms that can constrict the vision even of experts, and the multi-layered challenges one has to overcome to shift dominant perspectives in medicine and science, not only in the 1850s, but also today. The story in this book, for me, is like a duel between the waterborne theory and the miasma theory. In the hand of the waterborne theory (Like John Snow, Whitehead and Farr), the sword has the persistence to achieve the truth. It has the traits of science and respect for people’s lives. It is a tool that protects people. However, in the hand of the miasma theory (Like Chadwick, Hall), the sword is so arrogant and close-minded. It killed people though it has no idea why it killed people. If the power and tools are in the hand of the right people, it really helps to make life better. Otherwise, the catastrophe comes, like the DC lead crisis. Book description: This is a story about the 1951 discovery of the first immortal line of human cells called “HeLa,” a code name that was based on the first and last names of the woman from whom the cells were taken: Henrietta Lacks. For the past six decades, HeLa cells have been mass produced, commercially sold, and used to help achieve numerous biomedical breakthroughs, including the development of the polio vaccine, the first animal-human hybrid cells, chemotherapy, cloning, and in-vitro fertilization. Skloot’s narrative foregrounds a side of the HeLa revolution that had received little attention prior the publication of her book: the fate of Ms. Lacks and her family, as well as their controversial treatment by the medical establishment. It also raises complex and timely questions about patient rights and the multi-billion dollar human-tissue research industry today. 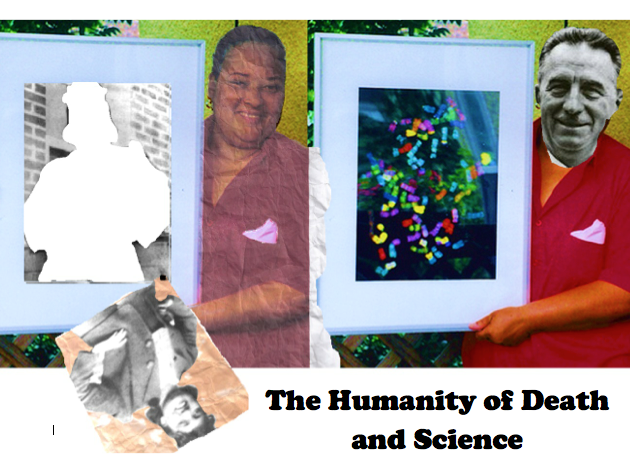 I was trying to capture the humanity of death and science by looking at what, in Henrietta’s death, the two extremes (the Lacks family and Scientists) in the book were focused on. In her death, Henrietta left something very important behind that needed a lot of tending to…for scientists, that was her cells to be studied and manipulated for discoveries that contributed to the betterment for the greater good. A major theme of this class is the dehumanization of people by scientists of their subject – whether it is denying their informed consent, manipulating their perspective on technically complicated issues, or literally never thinking of them as a human. For the Lacks family (or maybe just specifically Deborah), Henrietta left behind a mottled legacy that she desperately needs to understand to come to terms with her mother’s spirit that she believes is living on, possibly wrongfully, through her cells. We see this in the humanization of the storms and in the unforeseen turns in the lives of people that are involved in the story, like our author Rebecca Skloot. This is what the picture represents to me. For Deborah, a crumpled up picture of her represents a person that is emotionally and [arguably] physically affected by her desire to know about her mother, the empty focus of her frame. In a way, she is holding onto very specific but limited information about her mother and we see that represented by the tack at the bottom right of the frame that turns the picture of Henrietta upside-down, which is accurate both in a physical and metaphorical sense. For scientists, the focus is very clearly the cells. I have cropped Dr. Gey’s head over Deborah’s because in the pursuit of the scientific aspect of Henrietta, save a few, most scientists removed the Lacks’ way of thinking about her mother and imposed their own desires in a way that, by today’s standard, is ethically questionable. Book description: This is a book about the rise and fall of research scientist Jan Hendrik Schon, a presumed prodigy in physics and nanotechnology and a celebrated employee at Bell Labs between 1997-2002. In his early 30s, Schon both reeled and enthralled the scientific community when he claimed to have built high-performing nano-transistors out of plastics. Schon’s work was published in the most prestigious science journals and inspired researchers in the US and abroad to invest significant amounts of time and money to try and replicate, if not advance, it. Eventually Schon’s discoveries were shown to have been intentional fabrications. This story offers valuable insights into the history of scientific fraud and Schon’s personal journey of deception, but it also raises important questions about the culture of the scientific community – scientists, scientific journals, employers, and awards – which embraced for as long as it did Schon’s lies. 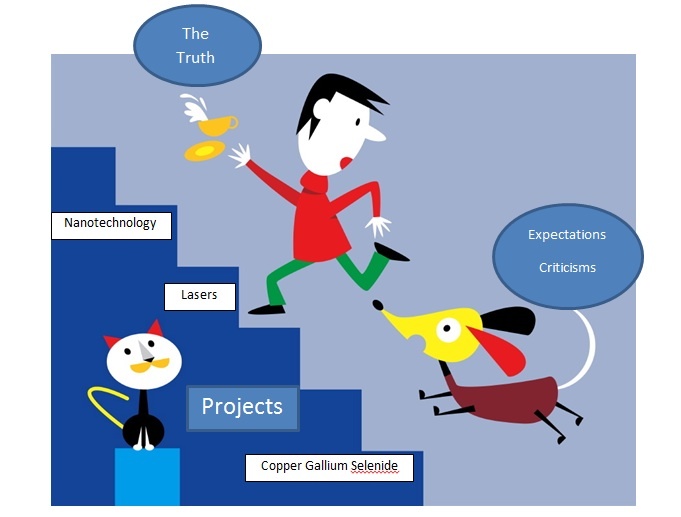 The picture represents Schon jumping from project to project to run away (avoid answering) criticism and expectations on his former projects from other scientists. The tea in his hands represents truth. The faster he has to run, the more likely the truth will be spilled (revealed), which is what happened to him in the end. We developed this activity after learning about, and feeling inspired by, a similar practice at West Point Military Academy. We assign it at the closing of the semester, when students are able to reflect on what they learned, both about engineering/science ethics and, perhaps even more importantly, about themselves as professionals in-the-making. Aiming to reinforce introspection about, and articulation of, the foundational values underlying each student’s moral identity, the exercise involves the creation of a wallet-size “ethics card.” This card is to feature in no more than one sentence a moral ideal that students view as an unshifting North Star, which can offer them clarity and guidance during challenging times in their careers. We encourage students to try to define this ideal in their own words. However, students also have the option to feature a quote, an existing philosophical principle, a code of ethics in their specific field, a drawing, a photograph, or any other representation that speaks to them. Ethics cards can be plain or as artistic and creative as each student chooses. Our hope is that students will take ownership of their creations and use them in the future when they see fit.